The town of Ronda in the province of Malaga - Andalusia, Spain. 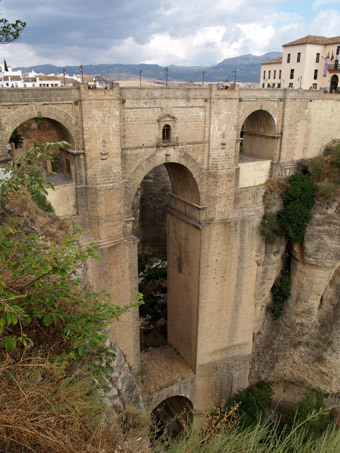 Seville online ES · The town of Ronda, Malaga - Andalusia, Spain. 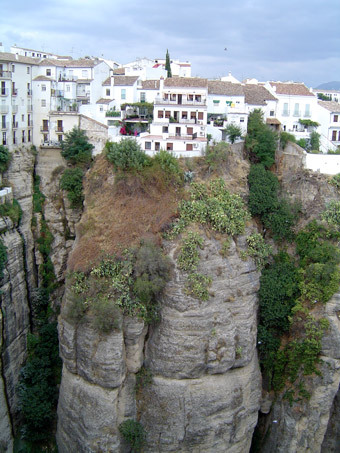 Ronda is one of those cities which appears to be located somewhere between reality and legend. Previously isolated due to its geographic reality, city of bullfighters and outlaws, destination of those fascinated by them, Ronda is now a city where you can enjoy a broad repertoire of monuments. Its gastronomy, festivals and surroundings contribute to growing the legend of this location. Situated in the most northwestern part of the province of Malaga , in Ronda is a city located on a ravine 120 metres deep which is considered as one of the oldest cities in Europe on account of its history. The small River Guadalevín traverse it, dividing the city in two. Its source caused the creation of the Tajo of a height of a hundred metres which nowadays is one of the marks of the city's identity. On one side you find Ronda the new, broad and happy, with its historical bullfighting ring, on the other the more intimate, older Ronda of palaces and churches where we can admire the Square of Duquesa de Parcent, on which the colegiata de Santa María de la Encarnación, stands out, a temple of complex architecture given that a gothic temple and the colossal Renaissance church are built on the remains of what was a Muslim mosque. The styles and origins mix in this white and artesan town: minaret towers such as that of San Sebastián; palaces such as Mondragón and that of Salvatierra; Renaissance, Baroque, Gothic churches; the old and well preserved Arab baths; gates to ancient ramparts such as those of Felipe V.
All of this complements the beautiful sites such as bridges which are views into the abyss, fountains such as Ocho Caños , situated next to the Padre Jesús Church , and the Bullring , one of the oldest in Spain.All of this being an aesthetic pleasure for the casual walker. Find your hotel Ronda now! But in addition to historical strolls through its beautiful streets, the surroundings of Ronda, situated in what we could call "Humid Andalucia", can offer the visitor all manner of alternatives: mountains turning abruptly into ravines in which it is possible to pothole, extensive forests of conifers in which you can see the Spanish Fir, grouped together in the Parque Natural Sierra de las Nieves; Sierra Bermeja, unequalled refuge of the Pinsapar; Sierra Crestellina, a paradise of the Griffon Vulture and a great variety of birds of prey. These are without a doubt locations which will delight all nature lovers and active tourism. Characters: In addition to the legendary outlaws "El Tempranillo" y "El Tragabuches" , there are many people wh have seen Ronda in its lengthy history. Ernest Hemingway , author of such novels as "Death in the Afternoon" and "The Old Man and the Sea", was a fan of bullfighting. It was this fondness for bullfigting which drove him to Ronda where he went to many bullfights of his favourite matador Cayetano Ordóñez. Amongst this number is also Rainer María Rilke , who called Ronda "the mad town". Rilke, who was attracted by the climate and the altitudewent to Ronda and during the course of this journey wrote "Collection of Spanish letters". 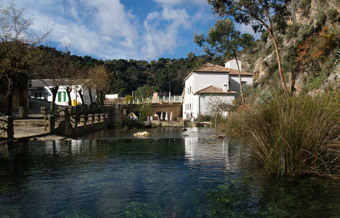 Amongst the festivals which take place in Ronda Easter (March-April) or the Pilgrimage of Ntra. Sra. De la Cabeza (May) stand out. 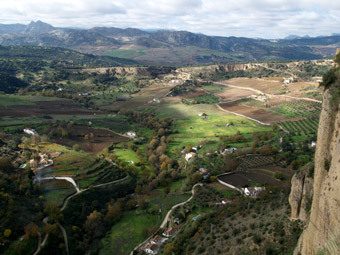 There are also other festivals in Ronda such as Carnaval (February) or the Festival of Pedro Romero (September).